Lack of sleep for new parents is an everyday norm and a serious issue that can quickly become a health problem for both parents and the baby. SNOO is a robotic bassinet that reacts to a baby’s cries and movements to replicate the 5 S’s, a method developed by world-famous pediatrician Dr. Harvey Kar, creating the world’s safest bed. Each element of SNOO was considered for its safety, functional efficiency, material quality and comfort. For the main enclosure, the curved structural elements hold a double layer of mesh. Three microphones detect the baby’s cry and distinguishing it from outside noises. Below the mattress are the sensors, speakers and a robotic engine that power SNOO’s intelligent response. 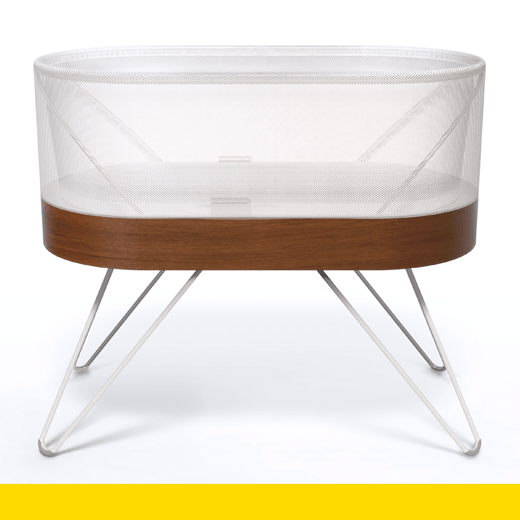 The outer layer of mesh facilitates the flow of fresh air and makes the baby visible inside the bassinet, a feature that enhances the parents’ feeling of connection to and protection of the baby.